Home » News » Free Trial Class Plus Free T-Shirt! Free Trial Class Plus Free T-Shirt! Join us for a Free Trial Class at our Fremont location and receive a Free T-Shirt! Kick-off your New Year with some fun! Join us for a free trial class at our Fremont location on select days and receive a free t-shirt. Select days include Sunday, Tuesday or Friday this January. Update – Offer extended through February! Follow this link and fill out the form. One of our staff members will reach out to coordinate your free trial class. 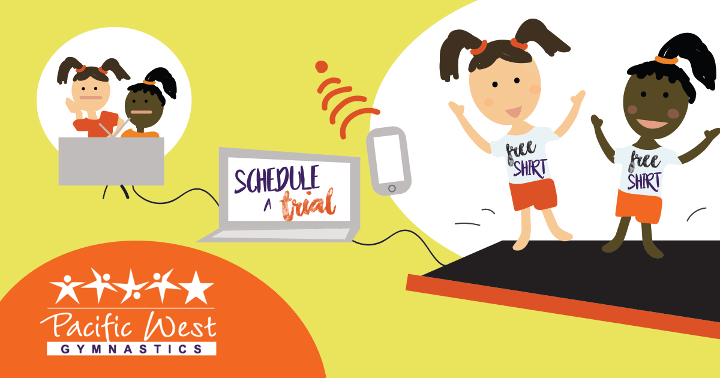 Come in for your free trial class, receive your free t-shirt, and go home with a happy kid! Invite your friends in for a free trial class. They’ll receive a free t-shirt and you’ll receive a $25 tuition credit when they enroll! Click a share button below to forward this special offer to your friends!